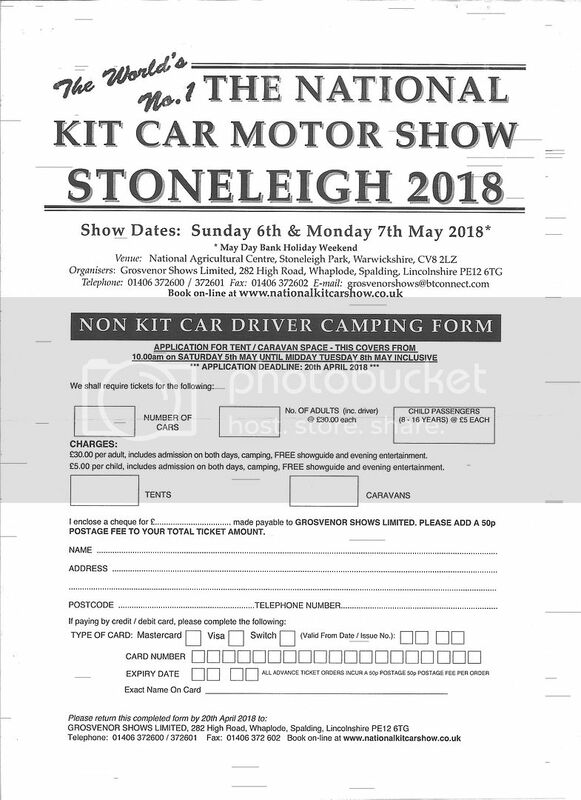 I have sent off the stand application form & below you will find the Kit & Non Kit camping forms. By the looks of the cars that are now becoming street legal we should have a very good line up. As I get more information I'll post it here. I know certain people will make comment to this, and I can take it, but this is a question I want to ask as I cannot find any reference and some people must do this. If you trailered a car to the show, where do you park the trailer ? Lots of people have, and you won't be the last! We usually make a space for it somewhere on the pitch - unless you're Acid, in which case it stayed on the trailer while he was there.... If everyone turned up with a trailer there might be a problem! In the words of Richard Hammond in The Grand Tour, when taking the Croatian electric supercar to the hill climb event in Switzerland (where he totalled it just after the finish line!) .... "People with racehorses don't ride them to the racecourse!" Each to their own Mark, but in my view just getting yourself and your car to Stones is what matters. My nova will definitely be there on the Sunday. I tried so hard this year to get it there so next year, by any means, it will be at the show. ... so my New Year's resolution is to block that weekend out in my diary and book a hotel! So how many miles have you done in it? There is a possibility I can come. If I can fix my engine woes and plumb the fire extinguisher system I got for Christmas. 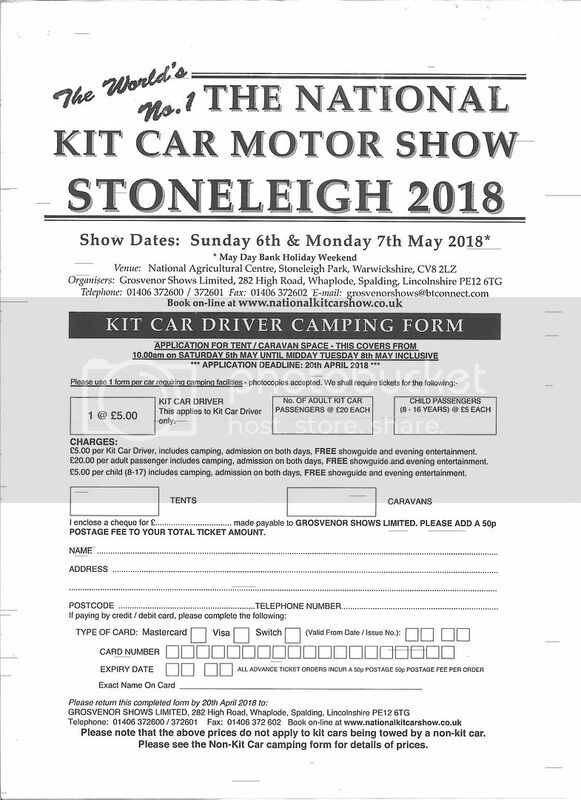 There are normally plenty of places around the stoneleigh site to park a trailer, it doesn't necessarily have to be on the club site. A few people park them just to the right of the main entrance as you come in to the site, there is a sort of mini carpark there. I'm currently in negotiation with the missus on making the show, so far it looks like I will be going. I'm now just trying to sort out the dates I come over. My dilemma is whether I come early and attempt to change my rear disk brake setup for the new EMPI kit I purchased before the show or not. The risk here is that if sods law kicks in and for some reason I don't get it done before the show, it results in my car being absent. So I'm currently erring on the side of caution and planning to come 1 or 2 days before the show and do all the work after the show. I plan to be there from Saturday night through to Monday, I will probably stay at the Holiday Inn in Kenilworth as it has an enclosed car park.